Effortless and contemporary and undeniably comfortable. This jersey top gives you the full range of styling options that suit your stylish needs (and wants). Fashion it with leggings for casual chic or your favorite denim jeans. I bought the black and the beije and they make me look so beautiful. I always wear it with jeans and can make it look fancy or casual. I'm glad I didn't read the comments because I probably wouldn't have bought them. They actually make me look so good. They are my favorite shirts/dress I've ever bought. Can't wait to buy more of these products. Buy it and if u don't like it then return it!! Love, love it!! Rhonda gets it when it comes to designing for women body types.I really like how this covers my girls but shows a tad bit something (spicy) at the same time. The flexibility of the top is really neat...can be worn with jeans, skirts, leggings. Any body type can wear this and be comfortable and yet fashionable forward. I was very pleased with my new top. Very flattering and true to size could be worn casual or could be dressed up for evening wear. I'm a little disappointed in this product. 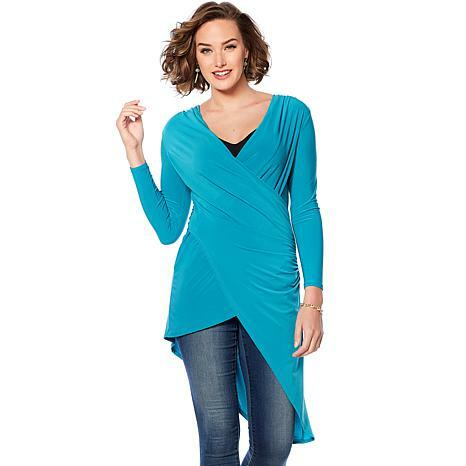 I purposely ordered a larger size that I usually wear but I still feel that I need a "shaper" - the fabric is very light and so it clings to every curve I have, and that's too many. I am keeping the top because I am currently wearing a back brace, which hides my curves. After surgery on 12/31, I will be able to exercise and lose weight and I will still be wearing my brace for awhile, I'm sure. One good thing is that the shear fabric isn't too hot.